This shows, like all Feldkirchner’s animal studies, an acute understanding of the form and movements of the wild animals which were his constant subjects for around two decades. 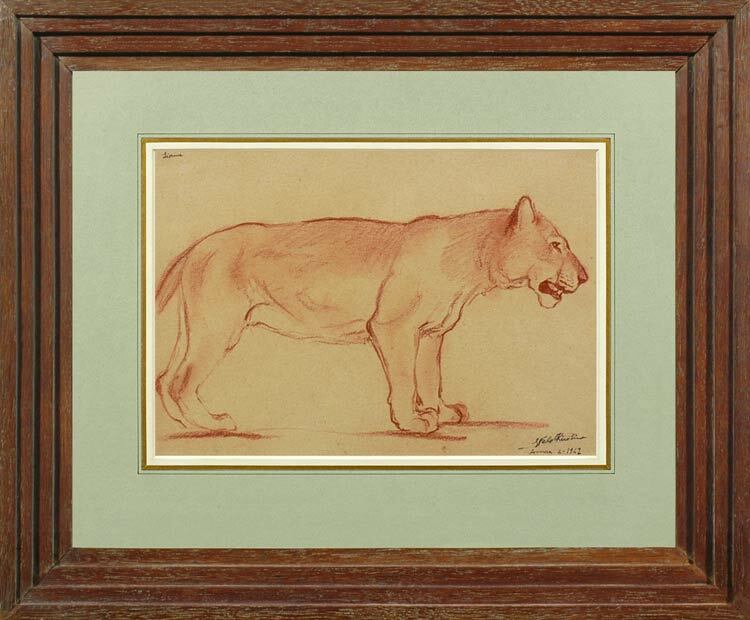 His conté crayon and pencil sketches on a beige Belgian paper are extraordinarily assured, often capturing in a single fluid outline the characteristics of the circus’s big cats, bears and monkeys. This study of a lioness epitomizes his work, creating the stance and mood of the animal with minimal elaboration. Very little is known of the life of Georges Feldkirchner. He was born in America in 1885, but moved to Paris, where he had an atelier in Montmartre. He worked as a painter, book illustrator and a sculptor, but is most noted for his studies of wild animals, made at the Cirque Amar and the Cirque Pinder from the late 1920s to the late 1940s. The Cirque Amar had been founded in Algeria in the 1860s and spawned a second branch in Paris in the late 1920s. It included all sorts of animals, even polar bears, so was a boon for artists. The Cirque Pinder was originally English, migrating to France in the 1870s. Toulouse-Lautrec, Seurat, Tissot and Chagall all produced paintings of circuses; nearly all these works, however, concentrated on the human performers.